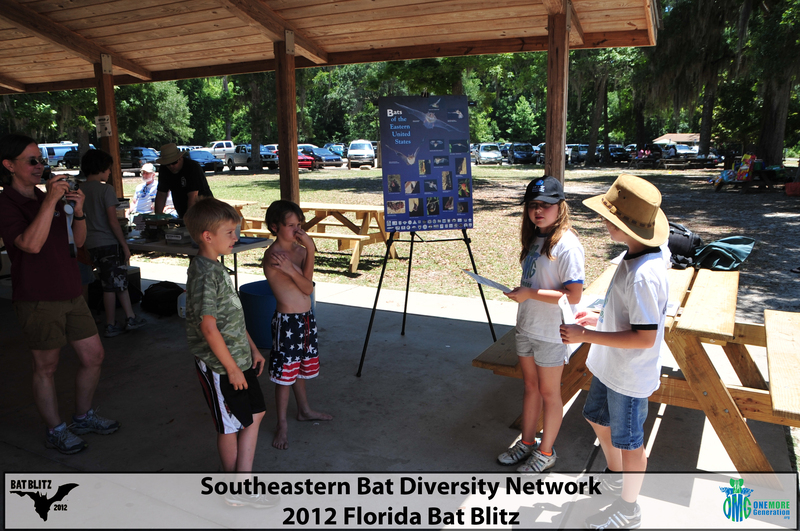 The goal of the Southeastern Bat Diversity Network is to conserve bats and their habitats in southeastern North America through collaborative research, education, and management. This year OMG founders Olivia and Carter were invited to speak at the event to some of the many visitors and help them understand the need to get involved with trying to help save bats all across the United States. This years events were held in the Apalachicola National Forest and vicinity located in the Florida Panhandle. OMG spoke at the outreach event which was designed to teach local folks about bats. The outreach event was from from 1:00 – 5:00 pm. The event was held at the picturesque Wakulla Springs State Park, one of the largest and deepest freshwater springs in the world. 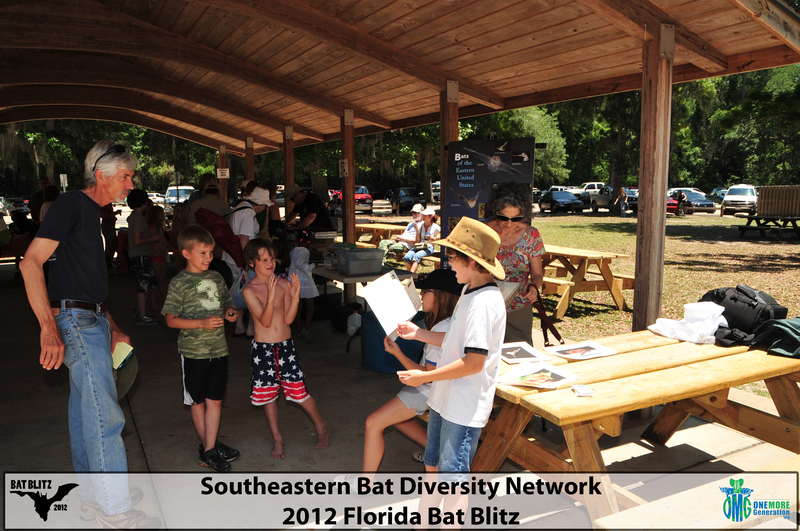 The SBDN provided opportunities to learn about the bats of Florida, discover the importance of bats in the natural world and in our daily lives, see live bats, play bat games, and participate in a raffle drawing. Carter and Olivia even brought along their own version of the “Test Your Bat I.Q. game which tested everyone’s knowledge on local bats and provided an opportunity to discuss the need for participating in local conservation initiatives designed to help protect bats. 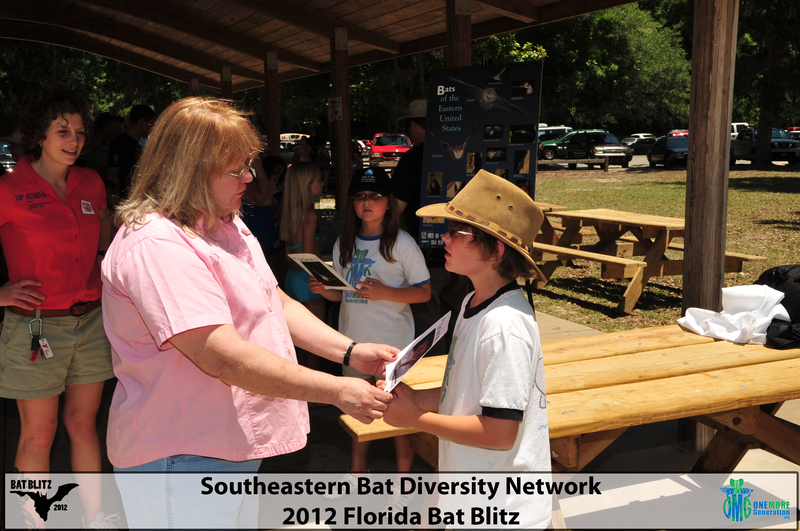 The annual Bat Blitz is one of our most successful programs. This event brings together biologists and land managers to gather important information on the bat fauna of a selected area. Bats were surveyed in and around the Apalachicola National Forest (ANF), Florida Panhandle (southwest of Tallahassee, east of Panama City). The ANF is the largest national forest in Florida, with nearly 600,000 acres. Much of the forest is dominated by longleaf pine and slash pine, with an understory of palmetto, gallberry, and wiregrass. Other interesting features include bay, cypress, gum, and titi swamps (where black gum, red maple, and wax myrtle are common), seepage bogs, and geological sinks which are surrounded by mesic hardwood forests. They also selected several survey locations outside ANF including Torreya State Park, Joe Budd Wildlife Management Area, Lake Talquin and Tate’s Hell State Forest, and Apalachicola Bluffs and Ravines Preserve. Pre-Blitz Field trips were also arranged including: TRIP 1: Watch the emergence of Southeastern Myotis from Judges Cave and TRIP 2: Field Trip: Mist netting in the Guana Tolomato Matanzas National Estuarine Research Reserve. Amongst other vital data, the Bat Blitz events serve as an opportunity to register the spread of the deadly White Nose Syndrome. Since the winter of 2006, White-nose Syndrome has killed more than 5.7 million bats in Eastern North America. White-nose Syndrome (WNS) is a disease caused by a non-native, cold-loving fungus now found in the caves of the affected regions. It was first discovered in New York caves during the winter of 2006-2007, initially killing half of the wintering bat population. The name of the disease refers to the white fungal growth found on the noses of infected bats. The fungus is currently killing hibernating bat species in 16 states and 4 Canadian provinces. It continues to spread across the continent. Little brown bats, once a common bat in the area, are sustaining the largest number of deaths. Caves infected with WNS are displaying a 90-100% bat mortality- wiping out most of the cave bat populations. A Department of Environmental Conservation survey shows a 93% decline of little brown bats in 23 caves at the epicenter of WNS. Currently five other hibernating bat species are affected by the fungus: big brown bat, northern long-eared bat, tri-colored bat, eastern small-footed bat and the endangered Indiana bat. The disease is spreading rapidly and has the potential to infect at least half the of the bat species found in North America. What is this fungus and how is it killing the bats? That’s what many bat scientists are asking themselves. We still don’t have all of the answers or a cure. The white fungus found on the bats is scientifically called Geomyces destructans. Research has shown that WNS infected bats are awaking from hibernation as often as every 3-4 days as opposed to the normal every 10-20 days. The fungus damages the connective tissues, muscles and skin of the bats while also disrupting their physiological functions. The bats wake up dehydrated and hungry during the cold winters when there are no insects to eat. Unfortunately, about 90% of the bats affected perish due to starvation. Bats are the primary predators of night-flying insects. They eat large numbers of moths and beetles. Insect-eating bats are crucial to a healthy ecosystem. Bats play a crucial role in maintaining an ecological balance. An individual bat can eat thousands of insects every night. By controlling insect populations, bats are critical to forestry, human health and they also save the agricultural industry at least $23 billion dollars each year. Without bats the agricultural industry will use more pesticides and food costs may also increase. You should not handle bats. If you come across live or dead bats with White-nose Syndrome, contact your state wildlife agency or a nearby U.S. Fish and Wildlife Service office. Cavers are asked to continue to observe all cave closures and advisories, and to avoid caves or passages of caves containing large hibernating populations of any bat species. Everyone should follow proper decontamination protocols when visiting caves, mines or coming in contact with bats. You can also help the bats survive when they are not hibernating. Plant moth-attracting wildflower gardens to give bats food to eat. Leave up dead or dying trees to give bats natural shelter. Build or buy a bat house to provide adequate roosting for bats in your area. Teach your friends and family about the importance of bats. Donate Today to the folks at The Organization for Bat Conservation. 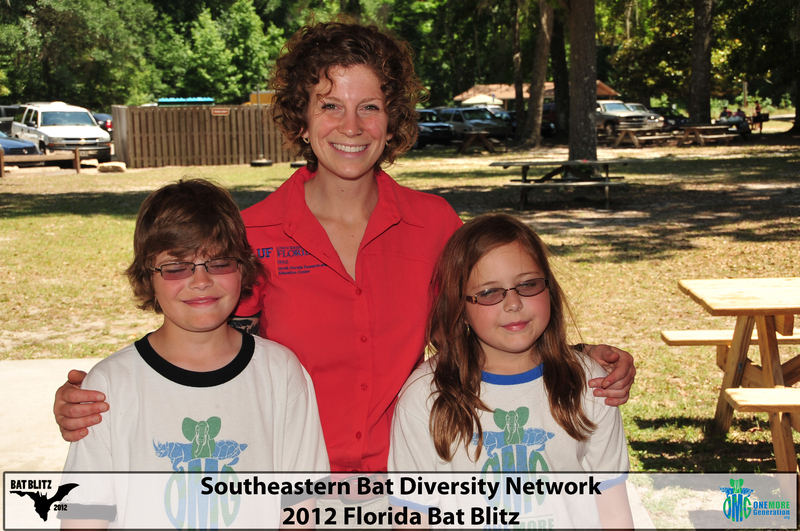 We wish to thank the organizers of this years Bat Blitz 2012 (and especially Sarah Friedl from the University of Florida) for allowing OMG to be part of the event and we hope our participation helps to spread the word about the need to help save these amazing species.